Earlier today I pointed out that revenue in the budget deal is not inconsistent with recent Republican talking points if the revenues come from cuts to tax expenditures. A question was raised: wouldn’t it be more regressive—meaning hit middle and lower income people harder—to raise revenues through cutting tax expenditures than through higher marginal rates? Probably, but it depends on whose rates you raise versus which expenditures you cut. The Tax Policy Center runs scads of useful tables on this sort of thing and below is a figure on the incidence of home mortgage interest deduction, which clocks in around a cool $90 billion (that’s an annual cost, btw). About 9% of the benefits go to middle-income homeowners, but 67% goes to the top fifth and (not shown) 43% to the top 10%. So, cuts here would be pretty progressive (they’d also be ill-advised given the current housing market, but in normal times this expenditure is a target of most economists). Of course, if you just let the high end Bush tax cuts sunset, by definition, 100% of the incidence falls on the top few percent. Conversely, if you went after a tax expenditure like the Earned Income Tax Credit, a wage subsidy for low-income workers, you’d be both deeply regressive and kinda cruel. If grownups break through the barricades and the budget talks yield any revenues, they’ll come through cuts in tax expenditures, and this type of incidence analysis will be important. Stay tuned. Share the post "Who Gets Hit?" 10 comments in reply to "Who Gets Hit?" Republicans are playing games with our debt ceiling because they don’t want to raise taxes on themselves: the rich. I can stand to see people like Eric Cantor and Jon Kyl having their taxes raised. Considering the enormous disparity in income and taxes between the median and the top 5%, though, it’s worth asking how the impact distributes compared to either income or taxes paid. Saying that billionaires will lose more in absolute dollars isn’t going to be very much consolation to someone who just watched an extra week’s pay per year go to taxes. And, yes, I realize that deductions in general disproportionately benefit those in higher marginal brackets — but the question still should be asked. Simple. Cap the deduction. Pick a number. 20K/yr.? 15K? 22K? The upward redistribution of income and wealth *is* the problem. Fix that and so many of the economic maladies just start fading away. Artie yes a cap of that sort would make this proposal highly progressive. Currently the cap is interest paid on up to $1 million in loans–it’s way too high, resulting in the regressive “tax expenditures” (high-income tax filers benefiting more from deductions). A deduction cap of $15-25 thousand would encourage middle class home ownership but not subsidize McMansion shopping. This might be interesting if the horizontal axis was better defined. Quintile of what? Yes, i see the reference to income but beyond that there’s no data for me to ascertain if I would be considered “Top Quintile”. I claim mortgage interest but certainly don’t consider myself rich! 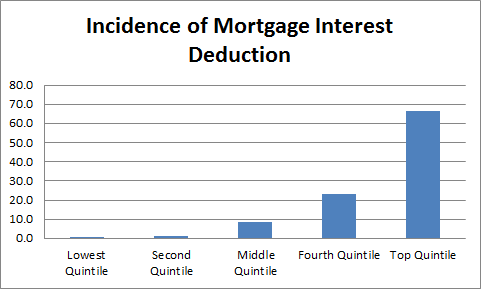 Replacing the mortgage interest deduction with a capped credit could be an improvement in terms of revenue and equity. With luck the final debt ceiling package won’t be too regressive and too contractionary. I’m not holding my breath. We shall see. I see a simple problem with retaining deductions vs. replacing them across the board with progressive rates: simplicity. This may not occur to progressives, but there are really three basic problems with taxes in this country. One is that people simply don’t like to pay them. The other two are that they’re too darned hard to understand and thus to pay, and that it’s impossible to understand who pays how much and where it goes. I’m talking about ordinary citizens, not economists and (computer) scientists. How many people are able, really, to do their own taxes, with any degree of certainty? I’ll bet it’s less than 5%. Again, KISS. Or KISfS. Keep it simple _for_ st***d.
EITC seems like a counterexample, but it’s not. Rates can be, in math terms, negative. Paid out instead of in, like refunds. Essentially, a cost of living wage. Make it high enough to replace all the other individual social services stuff that costs a bundle to administer: food stamps, unemployment benefits, etc., with a payment to the individual who needs it. I believe even Nixon (maybe Ike) once suggested as much. It’s WJWD – What Jesus Would Do. BTW, saw you with Van Jones on TLW. Warmed my heart, seeing you with a black progressive on a socialist’s TV show… 8^) It was all good. But I saw something again that I’ve seen on other of your recent TV appearances and that you’ve admitted to – you’re an optimist, to a fault, JB. It speaks well to your character, but I think it calls your judgement just slightly into question, IMHO. Here’s the thing: being optimistic about problems and their potential solutions can serve as an excuse not to do due diligence to solve them. Being coldly objective, even a bit pessimistic, about problems and their solutions is sometimes what it takes to go far enough, both in recognizing the full extent of a problem, and making sure to solve it as best as reasonably possible. I would suggest that thinking of Republicans as not being grownups is an example of this. That understates the problem, in an attempt to give them credit they don’t deserve. They know what they’re doing, and they’re not going to help solve the problems – as Van Jones said directly, they are the problem. Your optimism ostensibly on their behalf doesn’t. They are not going to come to the table over the debt ceiling or tax increases. Read their lips. Optimism to the contrary does more harm than good. Prepare for the worst, and act accordingly. That’s what responsible professionals in all fields should do; there are places for optimism, and places where it’s more than a bit irrational and, to use your word, irresponsible. But I still love ya, JB. Hang in. You’re doing the best you know how – I can see that clearly. BTW, a personal data point: I paid $80 – $80!!! to have my taxes done for 2010, and I had $0 taxable income! I’m not crazy for doing it. I get hassled just about every year by my local government for something or other, even when my taxable income is $0. I don’t see that I really have a choice. And I have a PhD – I really should be able to do my own taxes with some confidence. But it’s not about arithmetic; it’s about nonsense tax laws that even the people who wrote them don’t understand. As a socialist, I really would prefer competitive public ownership and thus public profits as an alternative to taxes. But all I supppose I can do is keep mentioning ideas like that to people like you. I’m curious about why the Administration does not at least threaten administrative action on tax loopholes. For example, the decision that royalties in Saudi Arabia were “taxes” was administrative, if I recall correctly. “Of course, if you just let the high end Bush tax cuts sunset, by definition, 100% of the incidence falls on the top few percent. Conversely, if you went after a tax expenditure like the Earned Income Tax Credit, a wage subsidy for low-income workers, you’d be both deeply regressive and kinda cruel. Since your ex-boss isn’t a grownup (as demonstrated by his refusal to do the first when he had the chance, even as he was talking about controlling the deficit being key to jobs), why should anyone negotiating with him try to be one?